Carlton Court’s elegant and exquisite selection of spacious apartments are considered as the ideal accommodation for business and leisure travellers in London. We continuously strive to provide our guests with a truly unique experience in our 1, 2 and 3 bedroom fully-furnished apartments. Our property is located in Mayfair and enjoys excellent transport links to the major business centres and tourist attractions that the city has to offer. At Carlton Court, we offer our esteemed guests a 24-hour concierge services. We pride ourselves on being able to assist guests with individual travel arrangements. Our services give travellers the inside knowledge about the local area, public transport links, restaurants, theatre shows and much more. We make it easy for travellers to explore the city of London as if they were locals. 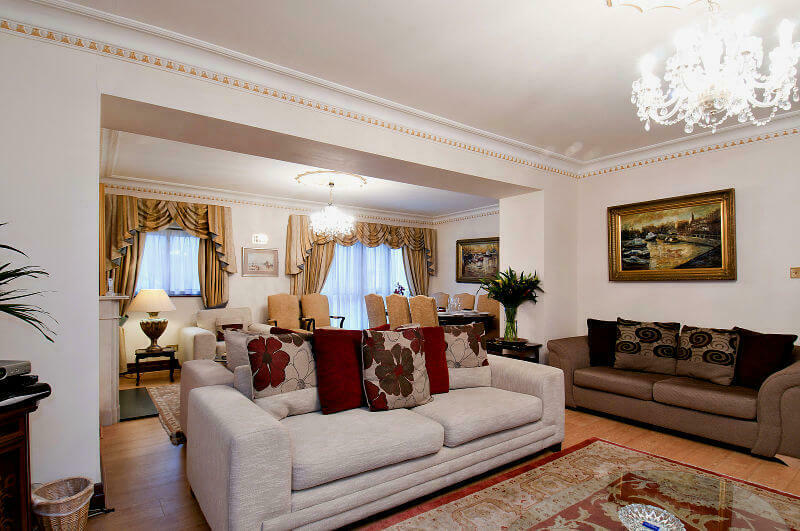 Our central London apartments are particularly well-liked by tourists because of the homely, cozy feel they exude. We provide you with a range of unique apartments that have separate living, dining and sleeping areas complete with plush furnishings and entertainment equipment. Each one of our apartments comes with free high-speed WiFi ensuring superior connectivity. Our apartments come with fully-fitted kitchens complete with dishwasher, cooker, washer/dryer, cutlery and more. We even keep the pantry stocked, so that when you decide to stay in, you can cook a delicious meal without any hassle. The best part about staying in one of our properties is the fact that you can enjoy home-style living, along with 5-star hotel services. Since you are on a holiday, we do not want you to even lift a finger. Our housekeeping/maid services are in place to take care of the cleaning etc. At Carlton Court, we put the emphasis on making sure our guests are relaxed and well looked after. To ensure that your stay is what you expected, we greet you with a fabulous Welcome Pack containing fruit, flowers, chocolates and drinks. Our entire team works very hard to make you feel special every day of your stay. For your next break, choose Carlton Court for a luxurious stay at a price that is affordable to all. Book today to avoid disappointment.